Jorge began working with SOL in 1996. He previously worked for the municipal mayoral office of Matagalpa, where he taught classes for over 16 years. This is where he acquired the knowledge and skills to work with children and youth of different ages. Jorge has also worked in public schools, such as Las Calabazas, the Franciscan Institute of Rubén Darío, and the San Antonio Parish School. Jorge began his musical career as a Mariachi. He sings and plays the guitar, and performs in many local events and festivals. 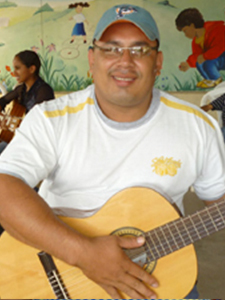 At the SOL Learning Resource Center, Jorge teaches students of all ages to play the guitar and recorder. He also directs a band, named Grupo SOL. Under his direction, Grupo SOL recorded a CD in 2000 and toured different cities in Northern California. Grupo SOL also performs at a variety of venues in Ciudad Darío and other communities.